Photo courtesy John Pennell, PIO, USARAK Public Affairs, Oct. 2, 2012. Friends of Nike Site Summit is on the final stretch of its preservation activities at Site Summit. Since 2010, Friends of Nike Site Summit, through fund raising and volunteer efforts has restored five buildings at Site Summit and is nearing completion of its sixth building. The sixth building is the Launch Control Building, the largest and most complex building FONSS has taken on. It was the heart of operations at the Missile Launch and Storage Area. Missiles were repaired and maintained here and security operations were headquartered here. Preservation work at the building is nearly complete but FONSS needs your help. Completing preservation work means replacing the badly deteriorated roof of the building and in 2013 we finished replacing about half of the roof. To complete it FONSS needs to raise $50,000. Any amount you can donate will help and it is all tax deductible. Please follow the "LCB Fund" link in the menu at left and help FONSS finish the Launch Control Building. FONSS will hold its annual volunteer training workshops on Thursday, March 13th and Thursday April 24th from 5:30 to 8:30 pm at the Commemorative Air Force Hangar (the big hangar marked "Hangar.Net") at Merrell Field. All volunteers are required to attend a training session, which includes Range Safety, Historic Preservation, and Hazmat Safety training. This training must be completed annually, so you'll need to attend even if you had it in prior years. Please RSVP to Doris at fonss2007@gmail.com if you plan to attend. Volunteers do not need not be a highly skilled to participate. Onsite work ranges from carpentry to painting and brush clearing, to assisting with tours. Join Friends of Nike Site Summit for its Annual Open House! Friends of Nike Site Summit will honor its volunteers and update the public on activities at Nike Site Summit this summer. Come learn about FONSS' first full summer of guided tours of the site, how restoration is progressing at the site, and how you can help. Whether you're a Cold War veteran or just interested in historic preservation we have a place for you. For more information contact Doris Thomas at fonss2007@gmail.com or (907) 694-3570. For additional information visit our Facebook page. As FONSS moves forward on restoring the Dog Kennels this summer some of our supporters may have questions. Why restore the Dog Kennels? Why are they important? What is involved in planning? An important part of preservation is telling the story. The more that remains of a historic site the easier it is to tell the story and convey a sense of our heritage. 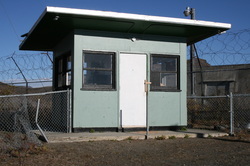 The Dog Kennels, along with the Sentry Stations, the Inner and Outer Fences, and parts of the Launch Control Building tell the story of site security. Controlling access to this site and thousands of other military sites across our nation and around the world was part of the Cold War story. Having the actual buildings that were used in carrying out this mission conveys the sense of secrecy and security that veterans like Tom Robson, Greg Durocher, and Tom Namtvedt ensured as MPs at Site Summit. In planning for the restoration of the Dog Kennels and other buildings at Site Summit the Project Committee rely on a number of things. First, as preservationists we try to use existing materials wherever possible. Notice in the photos above that some of the wood is the original wood used in constructing the wall. If too much of a historic building is restored using new materials then it is no longer historic. By measuring what remains and comparing it to as-built drawings we sometimes find that builders did not always go by the plans. Boards are cut to lengths relative to remaining boards instead of what the as-built drawings say they should be. Paint samples are taken and matched to ensure that the building is painted to look much like it did during the historic period. When complete the result is a historic building that preserves the look, feel, and construction of the original building to maximum extent possible. FONSS volunteer and treasurer, U.S. Navy veteran Bob Mitchell, and former Fort Richardson Garrison Commander Pete Mulcahy, also a FONSS volunteer raised the flag over Site Summit for the first time since 1979 during the August 17th tour. In addition to to the flag raising and tour, visitors were also treated to an aerial display by the Alaska Commemorative Air Force. FONSS has two filled up tours left for the season and approximately five work days at the site before winter weather sets in. A major goal is to complete the Dog Kennels which are ready for paint. FONSS volunteer Evan Rowland lead the effort on the Kennels this summer and, as you can see below, they nearing completion. Look for more tour date announcements in early spring 2014 as FONSS joins Anchorage's Centennial Celebration. Nike Site Summit tours are made possible with support from the Alaska Association for Historic Preservation (AAHP), The Magic Bus and Joint Base Elmendorf-Richardson (JBER). Time is short! FONSS needs your support! FONSS has applied for a $110,000 grant money from the Alaska Legislature for critical repairs to the Launch Control and Missile Maintenance Buildings. Since 2011 FONSS volunteers have spent thousands of hours residing, repainting, abating, and repairing these buildings. The final and most critcal part of this effort are the roofs, which are beyond the abilities or expertise of our volunteers and must be hired out. We are told that funds will be very tight this year due to declining oil revenue and other demands for state money. You can help by sending a message to the legislators below and asking them to support our funding request. wording is provided below, but please personalize your message. 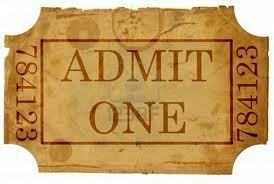 It is important that you say why preservation of Site Summit is important to you. we had our first ever public tours, and they were a huge success. We have seven tours scheduled for this summer -beginning with an evening tour on Summer Solstice, Friday, June 21st. FONSS is also working with Joint Base Elmendorf-Richardson (JBER) and the Lieutenant Governor's office to plan a Nike Site Summit commemorative event and Cold War Symposium for the fall of 2014. We are working to secure Sergei Khrushchev, son of Nikita Khrushcev and a professor at Brown University, as our keynote speaker. Grant funding this year will help us finish stabilizing the buildings FONSS is responsible for, and enable us to focus on showcasing this unique part of Alaska and Cold War history. Battery Building, ca October 2012. After standing for more than 50 years, battered by winter winds that sometimes approached 200 mph, demolition crews are nearing completion of demolition of the Battery Building at Site Summit. 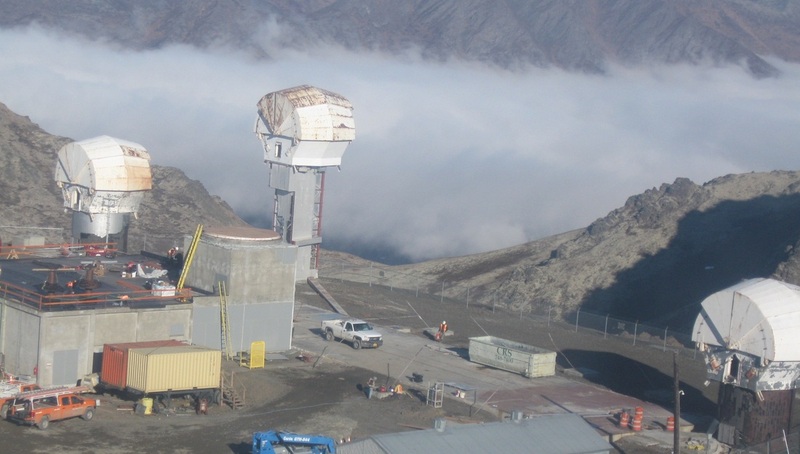 The fact that this 20,000 square foot building constructed on a 4,000' mountain stood this long is a testament to the incredible engineering that went into the construction of the site. The military proposed demolition of the Battery Building several times over the years and each time was met with strong opposition from the Anchorage community. 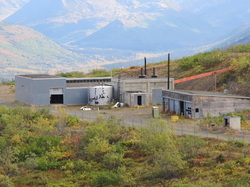 From 2007 to 2009 the U.S. Army and the Anchorage preservation community were engaged in, sometimes heated, discussions about the future of Nike Site Summit, which included the building. In the end an agreement was reached that preserved most of the buildings at Site Summit for interpretation, and even preserved a significant part of the Battery Control Area. As can be seen in the above right photo there is no question where the Battery Building once stood. The radar towers, foundation, and concrete portion of the building clearly define its location and help give clues to its size. When JBER begins the work of devising interpretive signage for the site they will have a lot to work with. As demolition was being planned JBER and Advanced Blasting worked with FONSS, NPS, and the State Historic Preservation Office to preserve key features of the site, including the steel tie rods that anchored the building on the mountain and the generators that powered the site. 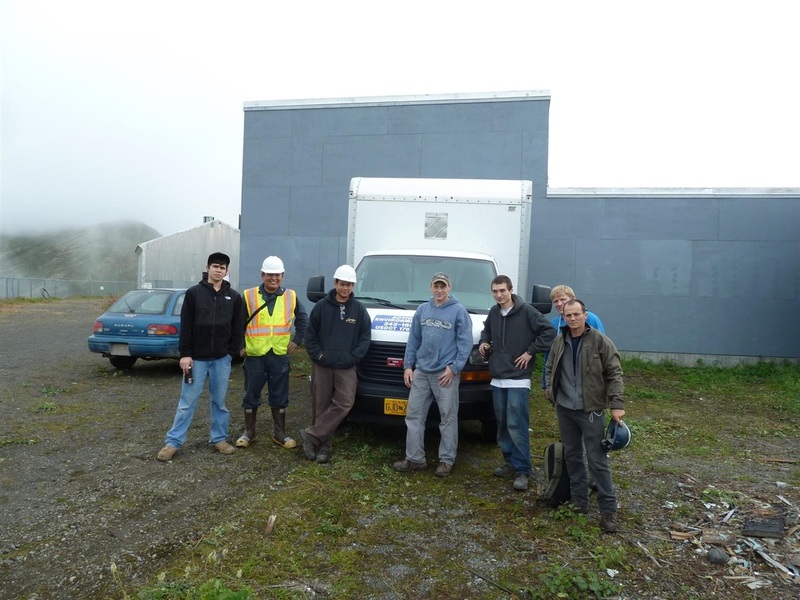 Huge Volunteer Effort Clears Launch Control Building of Hazardous Materials! Absolute Services Crew standing in front of the Launch Control Building at Nike Site Summit. Action Environmental Crew standing in front of Launch Control Building at Nike Site Summit. Alaska Abatement Corporation Crew standing in front of sign at entrance to Nike Site Summit. Central Environmental Crew standing in front of Launch Control Building at Nike Site Summit. A massive volunteer effort in August and September by hazardous material crews from Absolute Services, Action Environmental, Alaska Abatement Corporation, and Central Environmental, as well as FONSS volunteers, put a big dent into clearing the Launch Control Building of hazardous materials, such as lead based paint and asbestos. The work involved stripping contaminated sheet rock and other materials from the building, vacuuming dust and placing it all in a large special container to be hauled off site. 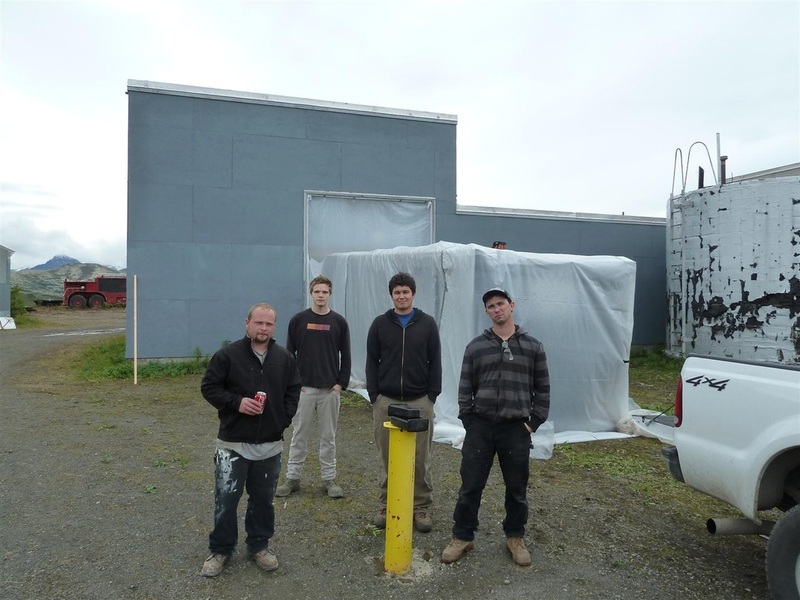 Alaska Demolition donated a disposal container, and disposal costs for 11.19 tons of asbestos! Not only is the building safer but the removal of wet sheet rock will help the walls and ceiling dry out, slow decay, and allow FONSS to gauge the level of damage caused by a leaky roof and plan repairs. In four days the crews completely removed much of the damaged sheet rock, and cleaned up a lot of debris! Thank you very much to each of you for all of your hard work! Dog Kennels Saved from Demolition! 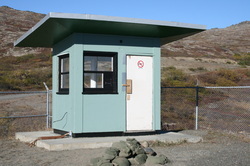 In May, at the request off FONSS, JBER removed the Dog Kennels from the demolition list so that they could be preserved. FONSS wasted little time in beginning stabilization efforts. In September, a FONSS crew removed hazardous materials from the building so that the work of repair work could begin. Project Committee planners will develop plans for stabilizing and restoring the building over the winter. 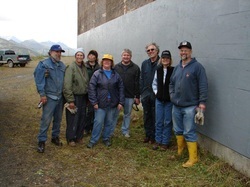 In June, the Alaska Historical Commission awarded FONSS a $25,000 Historic Preservation Fund grant to help with Nike Site Summit preservation work. FONSS intends to use this money to help with the Launch Control Building roof replacement. FONSS is very excited about this! This, along with the $50,000 appropriation from the Alaska legislature in brings FONSS closer to the approximately $150,000 replacement cost. FONSS' First Public Tours a Hit! Nearly 100 people attended the first public tours of Nike Site Summit on September 8th! Crystal clear skies greeted the crowd as they toured the site in the comfort of Magic Bus buses. FONSS Director Jim Renkert explained, as the tour began, that Nike Site Summit was one of 145 Nike Hercules Missile Sites constructed during the Cold War to defend against an attack by Soviet Bombers. The site is listed on the National Register of Historic Places as a nationally significant site, and is one of the most complete sites of its kind anywhere in the nation. Veterans Greg Durocher and Tom Namtvedt shared stories about their time at Nike Site Summit. To celebrate FONSS' first tours the tour groups were treated to an aerial display above Nike Site Summit by a World War II T-6 Texan, a Japanese Zero, and an L-1 Scout! From 1960-64 the U.S. Army conducted regular live fire exercises from Nike Site Summit. 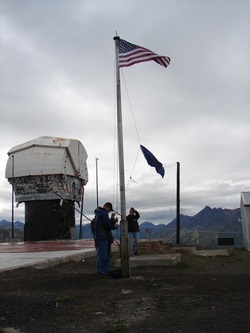 At nearly 4,000 feet the site is one of the of the highest altitude missile sites in the world and offers incredible views of Anchorage, Cook Inlet, the Alaska Range, Talkeetna Mountains, and Chugach Mountains. The September 8th tour was the first of many planned tours. More tours will be offered next summer. JBER informed FONSS on Monday that the contract for the demolition of the Battery Building was awarded on June 22nd. FONSS fought hard during negotiations with the Army to preserve the building, which housed the barracks and command functions of Nike Site Summit. The concrete portion of the building, foundation, and radar towers will be retained to help interpret the site. The iconic building, visibile from all over Anchorage, was by many considered to be the heart of the site. The barracks, with a mess hall, recreation area, barber shop, store, and command center was where many officers and enlisted men lived during their service at the Nike Site Summit. If you served at Nike Site Summit and have a story to tell about your time there please send us an email. We would like to hear from you. What was your experience of living and/or working in the Battery Building? FONSS thanks our partner, The Magic Bus. From Anchorage, take Glenn Highway about 2 miles north to the Arctic Valley exit. Proceed east approx. 7 miles to the Arctic Valley Ski Area lower parking lot. From Eagle River, take Glenn Highway about 6 miles south to the Fort Richardson exit, at the top of the overpass turn left; after crossing the overpass turn right; turn left at Arctic Valley Road; proceed east approx. 7 miles to the Arctic Valley Ski Area lower parking lot. Gearing up for the 2012 Summer Season! As the snow continues to melt at Site Summit FONSS the Project Committee is busy planning for its third year of preservation work. Committee Chair, Bob Mitchell, plans to submit the work plan for this summer's work to JBER this week for review. He observes that while on a June 16th reconnaisance trip up to Site Summit there was still a lot of snow drifted around the Launch Control Building, pictured at left. The good news is that the temporary roof drains installed last summer helped keep the inside of the building dry over the winter. With all the doors closed and windows covered none of the snow drifted into the building as it has in previous years. While the Project Committee has been busy doing its work the Tour Committee has been busy planning for FONSS' first official public tour of the site, which will take place in September. Details are still being worked out but FONSS is very excited to be nearing this goal! After more than 15 years of on-again off-again discussions between the military and the Alaska preservation community, and four years after FONSS' agreement with the Army, the public will finally get to tour this amazing Cold War Site! The video at right provides some great info on the Nike Missile System. While the Nike Zeus Missile, the third generation missile in the Nike family, was never deployed this video will give viewers some insight into the history of the Nike Missile program. Another Good Turnout for Volunteer Workshop! Fifteen volunteers attended the May 24th workshop hosted by FONSS, AAHP, the National Park Service, and Joint Base Elmendorf-Richardson. The workshop will consist of Unexploded Ordinance Awareness training; an Historic Preservation Overview; and Hazardous Materials Awarenes. This is a mandatory training for all individuals wanting to work onsite. Another workshop may be scheduled depending on the level of interest. If you are interested in volunteering at Nike Site Summit this summer please contact us. Come Visit Us at Anchorage's First Ever Historic Preservation Weekend! 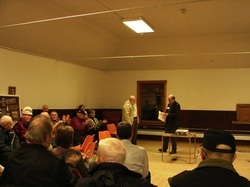 Mayor Sullivan has proclaimed February 11th and 12th Historic Preservation Weekend! Celebrations will begin with a ribbon cutting ceremony by Mayor Dan Sullivan at the Pioneer School House, followed by a reception, potluck and silent auction at 5:00pm. The Friends of Nike Site Summit and its sister organization, the Alaska Association for Historic Preservation will be there along with several other community organizations. Come get involved! Learn about volunteer opportunities and upcoming workshops. With the 2011 work season behind it FONSS is planning a retreat to improve the function of the board and plan for a transition into a new phase of operation. While preservation and stabilization work will continue for the foreseeable future FONSS must also plan for tours. Tour operations and preservation and stabilization operations are two different undertakings. Since FONSS' establishment in 2007 it has been a semi-formal organization focussed on advocating for the preservation of Nike Site Summit. With the completion of FONSS' stabilization requirements on the horizon, as required by the agreement with Joint Base Elmendorf-Richardson, the organization needs to look at its structural, organizational, and operational requirements going into the future. Thank You to FONSS' Volunteers of the Year! A big congratulations and thank you to Bruce and Wanda Long, FONSS' 2011 Volunteers of the Year! Bruce and Wanda are the Swiss Army Knives of the FONSS team. They always bring their big blue pickup and camper to a Site Summit work party and its jam packed with all kinds of tools. If an odd job needs an odd tool you can bet that Bruce and Wanda have the tool. Need a torch to loosen up a frozen garage door wheel - its in there! Wanda jumps right in - throwing sheets of plywood around, painting, working on the lift, and anything else that has to be done. But when lunch nears Wanda disappears into the camper to cook up one of her famous lunches...sloppy joes, chili, chicken tortilla soup, cake, hot chocolate, coffee, soda, fresh fruits and vegetable, cookies, crackers, chips, etc. When Wanda is there FONSS crews are always well fed! When the Project Committee was pondering how to best reach the high walls on the Launch Control Building, Bruce went to see Airport Equipment Rental. A few days later FONSS had a four wheel drive, three person lift delivered to Site Summit! And when FONSS' time was up and the lift had to go back, Bruce went to see EZ Rent. On the next trip up the mountain he towed a one man lift to finish work on the Missile Maintenance Building. Bruce and Wanda's contribution to FONSS cannot be over stated and is greatly appreciated. Thank you to both of you. Friends of Nike Site Summit and the Alaska Association for Historic Preservation invite the public to their second annual open house and reception Thursday, Oct. 20, from 6 to 8 p.m. at the BP Energy Center, 1014 Energy Court, in Anchorage. The evening will include displays and information about the restoration of Site Summit, the former Nike Hercules missile battery atop Mount Gordon Lyon. FONSS was formed by local volunteers in 2007 to advocate for the preservation of Nike Site Summit. In 2009, it partnered with the U.S. Army (now Joint Base Elmendorf-Richardson), the National Park Service, and State Historic Preservation Officer to preserve the historic mountaintop fortress overlooking Arctic Valley. FONSS' mission is to preserve and interpret the site for the education of current and future generations about the Cold War, and by doing this memorialize the millions of veterans who served during the Cold War. FONSS volunteers have made great strides this summer in preserving the Launch Control and Missile Maintenance Buildings, Phases III and IV of our plan. Last summer’s work focused on the three Sentry Stations that guarded access to the site. A presentation will showcase this summer’s accomplishments and FONSS’ plans for next summer. There is still much work to be done and FONSS is raising funds for more extensive work in 2012. Once the site is stabilized, FONSS will be coordinating limited public tours of the site in cooperation with Joint Base Elmendorf-Richardson. Work Season Nearing an End at Site Summit! 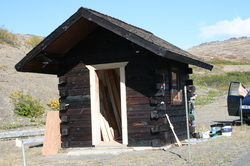 FONSS crews on Saturday, Sept. 10th and Wednesday, Sept. 14th made great strides in repairing the Launch Control Building. Both roof drains in the work bay have been repaired and routed outside; the high walls on the work bay have been completely re-sheathed and painted; the wall of the Launch Control Van bay at the back of the building has been replaced; the wall of the Boiler Room has been put back in place; and missing vents on the roof of the building have been closed up. Temperatures are dropping quickly up at Site Summit and FONSS is hoping for at least two more weeks of work before the snow flies. Our last day of work last year was October 2nd and it would be great to make it that far again this year. The new doors will go up on the Sentry Stations on Saturday to replace the temperary doors that went up last fall. 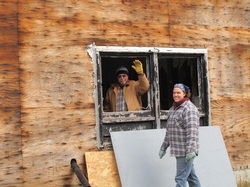 Remaining work on the Launch Control Building includes putting up the last of the sheathing on the back of the building; finishing repairs on roof drains; and sealing doors and window for the winter. Thank you to all the volunteers that have helped on this project. We have got a lot done in a very short period of time! Thank you to JBER for helping to coordinate the delivery of materials and equipment to the site so that this work could be done. A work party is planned for this Saturday. If you are on the access list and are available to work this weekend please contact FONSS. Open House Attracts a Crowd! FONSS held its first annual Open House on November 18th! More than 50 people crowded into the historic Pioneer School House to learn about FONSS' 2010 summer activities at Nike Site Summit, plans for 2011, acknowledge the efforts of our volunteers, and thank our supporters! 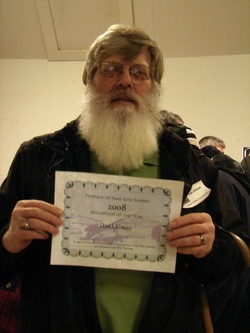 Dan Gilman received the Volunteer of the Year Award for 2008 for his work in establishing FONSS' website. FONSS Director Jim Renkert observed that "having a website is critical to establishing an organization's credibility nowadays" and Dan's work helped with that. Greg Durocher and Doris Thomas received Volunteer of the Year Awards for 2009 for all their work in organizing the National Nike Veterans Reunion. Bob Mitchell and Bob French were awarded the Volunteer of the Year Award for 2010 for their leadership in this year's preservation efforts at Nike Site Summit. Congratulations and thank you to each of you! 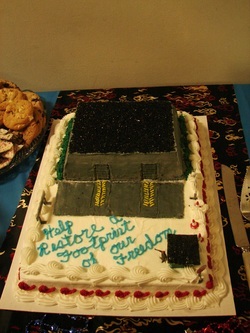 In addition to the congratulations and presentations there were lots of goodies at the Open House, including Wanda Long's really cool cake (pictured below, right) featuring a Missile Launch and Storage Building and Sentry Station! * November - held an Open House and Reception highlighting last summer's work. And the biggest and best news...from June through September we completed the stabilization and restoration of the three Sentry Stations! 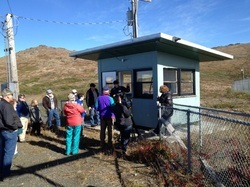 FONSS work parties totaled over 800 volunteer hours on the Sentry Station restoration! We couldn't be prouder of this year's accomplishments! You can also donate on-line by clicking the "Donate" link at left. Your gifts, regardless of the size, help us leverage larger grants and donations. Past fundraising has brought in about $10,000. This is seed money that will get us started on the way toward greater success. The need is substantial! FONSS needs to raise at least $100,000 for next year’s work on the Missile Maintenance Building. It’s exciting to see how FONSS is growing! Please help us continue our efforts to preserve Nike Site Summit and honor our Cold War veterans. FONSS Acquires Nike Hercules Missile! The Board of the Museum of Alaska Transportation and Industry (MATI) recently voted to loan the Museum's Nike Hercules Missile to FONSS on a long-term basis! Obtaining a missile has been a top priority of FONSS' since its inception. 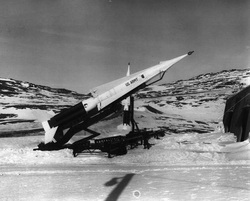 FONSS recognized early on that having a missile to display in parades and other public events would be a valuable asset in educating the public about the Nike Hercules Missile and for increasing awareness of preservation efforts at Site Summit. The Alaska Aviation Heritage Museum has graciously offered space at its facilities to house the missile. 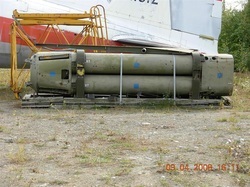 In 2009, the Alaska Gun Collector's Association donated $1,000 to help with missile acquisition and/or restoration costs. The missile is a training missile, which means that it was never armed or launch ready. It has been sitting outside for many years and is in need of a lot work. FONSS will work with MATI over the next week or two to finalize the loan agreement and get the missile to the Alaska Aviation Heritage Museum. FONSS volunteers will work over the winter to restore the missile and prepare it for display. If you are interested in volunteering to work on the missile restoration project please contact us. If you have any special skills that may be useful in restoring the missile please include that in your message. FONSS Director Jim Renkert will present to the Alaska Historical Commission at their Fall Meeting on November 30th. The Alaska Historical Commission is a forum for citizens' voices in the development of state history policy. Members advise the Governor on programs concerning history and prehistory, historic sites and buildings, and on geographic names. The nine-member commission includes the Lieutenant Governor, three citizens trained in history, architecture, or archaeology, an individual representing Native ethnic groups, two members recommended by the Alaska Historical Society, one member from the general public, and the State Historic Preservation Officer. Mr. Renkert will report on the grant that was awarded to FONSS by the State Historic Preservation Office at the advice of the Commission for this year's preservation work at Nike Site Summit. Phase 1, Nike Site Summit Restoration Completed! A huge crew of volunteers turned out Saturday to put the final touches on the Sentry Stations at Site Summit! Over the summer FONSS volunteers repaired the roofs, removed layers and layers of lead based paint, cleaned out the interiors, and repainted the buildings inside and out! Tom Robson lead an interior restoration effort for Sentry Station 3, which has brought the interior of the Station to near its 1970s appearance! FONSS ordered three new doors for the Sentry Stations, which came in mis-sized. They have been reordered but the three week time frame means they might night arrive before winter settles in up there. The white, panel doors are intended to get them through the winter, unless weather cooperates and FONSS is able to get them in toward the end of October. See more Sentry Station Restoration Photos. 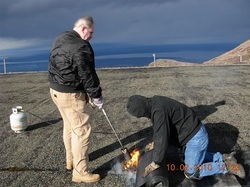 Bob French lead a crew to patch the roofs on the Missile Launch and Storage Buildings on Saturday. His crew completed patching the roof on Missile Launch and Storage Building 1, and hopes to get a patch on the second building next weekend. Missile Launch and Storage Building 2 has a two inch crack extend all the way across its length. Crew Braves High Winds and Cold to Carry Out Critical Preservation Work! Gordon Higby, Floyd Faulkner, Steve Pearson & Bob French pulled off some critical preservation and stabilization work on Saturday! With a skiff of snow on the upper site, and active snowstorms over the Chugach Range to the east, they almost didn't get to the site. They had choice of wind on Saturday or rain on Sunday! They chose wind! And despite having an OK from JBER Range Control earlier in the week, the crew found that a platoon was bivouacked at lower Site Summit. After the platoon called and let Range Control know that they would not disturb their training session, they headed up. With 50 plus MPH winds blasting the site they went to work! Gordon focused on pulling the broken and collapsing wall in the Launch Control Building back upright and shoring it up. While he did this Bob, Steve and Floyd worked on patching the roof on Missile Launch and Storage Building #2. While FONSS had not planned to do any work on either of the Missile Launch and Storage Buildings, or on the Launch Control Building we reached the end of the summer, and determined that we could accomplish some relatively easy repairs that would slow the deterioration of some of the structures. It likely will be a couple of years before the Army is able to replace the roofs on the Missile Launch and Storage Buildings but with a 2 - 3 inch wide crack across the length of each roof, the roof insulation was saturated and the metal roof structure was rusting. FONSS hopes that the over 300 feet of patches allow the insulation and roofing to dry out. The broken wall on the Launch Control building was even more of a concern for FONSS! At some point over the last 30 years a large vehicle ran into the wall cracking three studs and causing the roof to sag. Over last winter vandals pulled out one of the cracked studs and FONSS became concerned that if the wall was not repaired this year a heavy snow load would cause the roof to collapse this winter. Gordon pulled the buckled wall straight, installed new doubling studs, and installed some temporary plywood sheathing over the exterior. Bob French observed, "All in all, it was a highly successful day of work, and we drove off the mountain in high spirits, knowing that we had done our "Good Deed" to help make sure that the buildings will survive to tell their story to future generations."